The Tuesday bird walk will be going to Columbia Beach on January 31. We will meet at Parksville Community Park at the parking lot near the Lions Playground at 9:00 A.M. or the parking area off Admiral Tryon Blvd. at about 9:20 A.M.
Black Turnstone: Ralph Hocken Photo. The Tuesday bird walk went to Rathtrevor Provincial Park in Parksville. The morning was raining with very strong winds off the Straight of Georgia. We spotted a Golden-crowned Kinglet feeding down low just off the trail. Over one hundred Brant were just off shore, along with a dozen Black-bellied Plovers and about fifty Black Turnstones. 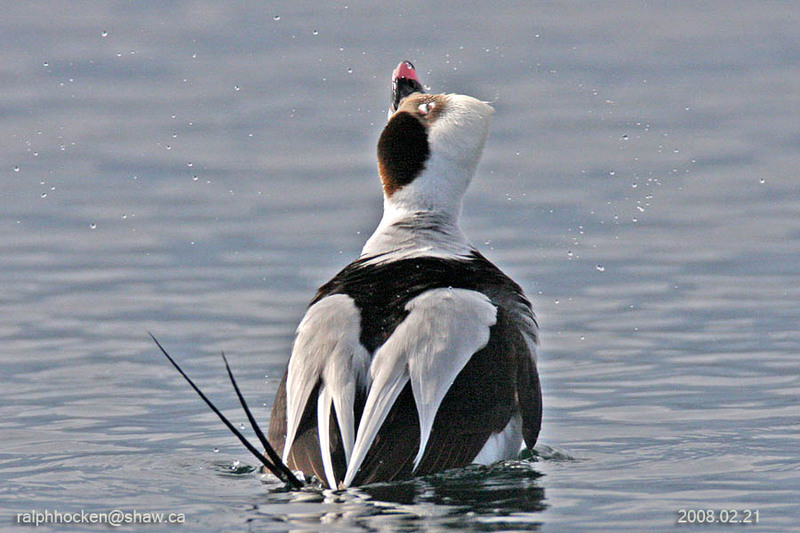 The Tuesday bird walk on January 24 will be going to Rathtrevor Provincial Park in Parksville! 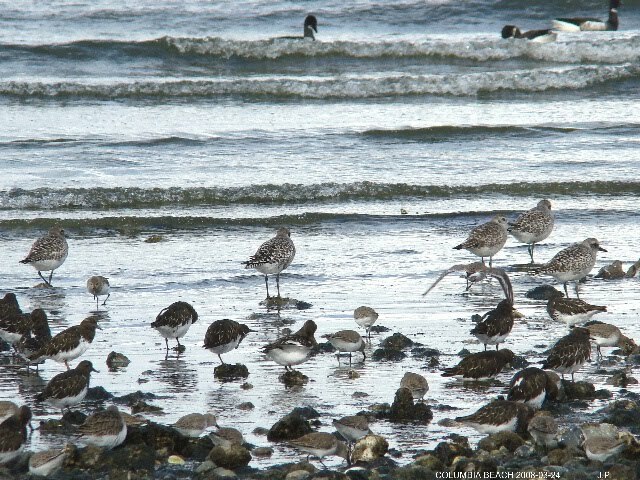 The Tuesday bird walk on January 31 will be going to Columbia Beach! Light coloured Canada Geese: John Purves Photo. The Tuesday bird walk went to Deep Bay. The morning was cold with snow flurries and a strong biting wind off the Strait of Georgia. The highlights included seeing a Cackling Goose in with a flock of mostly Richardson's Race and Common Canada Geese. Three of the Canada Geese were very unusual. They were light coloured with a dusting of white on their brown necks and heads, rather than the usual black heads and necks. The Tuesday bird walk went to Deep Bay. The morning was cold with snow flurries and a strong biting wind off the Strait of Georgia. 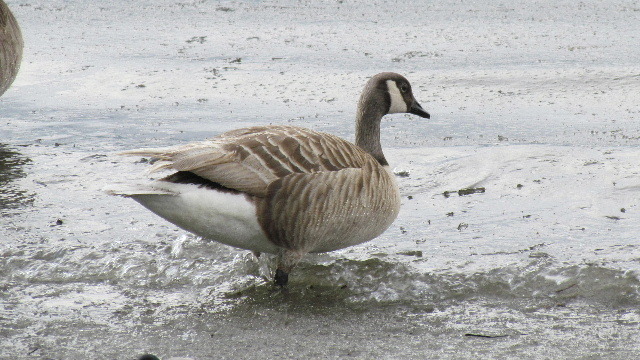 The highlights included seeing a Cackling Goose in with a flock of mostly Richardson's Race and Common Canada Geese. Three of the Canada Geese were very unusual. They were light coloured with a dusting of white on their brown necks and heads, rather than the usual black heads and necks. 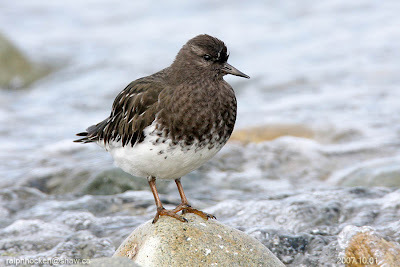 We saw a flock of Black-bellied Plovers, Black Turnstones and Dunlin resting on the snow near the shore. The big sighting of the morning was twenty-eight Long-tailed Ducks in the water not twenty feet from the point giving us all great views of this special duck. Eight cold and snow blown birders including two visiting birders from Australia saw and heard the following forty-three species. 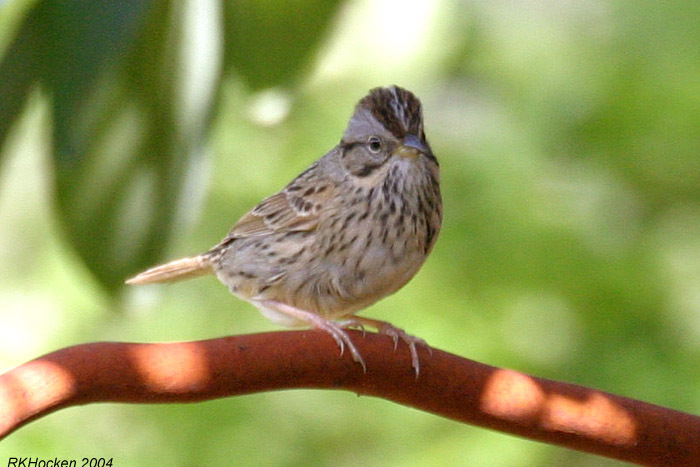 Lincoln’s Sparrow: Ralph Hocken Photo. The Sunday bird walk went to Nanoose Bay. The morning was sunny and calm but quite cool. The highlights included seeing four Red Crossbills perched on top of a bush close to us. A Red-tailed Hawk was perched on a tall tree giving us great looks. We spotted a Lincoln’s Sparrow near the trail. Canada Goose, Eurasian Wigeon, American Wigeon, Mallard, Gadwall, Greater Scaup, Northern Pintail, Green-winged Teal, Surf Scoter, White-winged Scoter, Bufflehead, Common Goldeneye, Barrow's Goldeneye, Hooded Merganser, Red-breasted Merganser, Horned Grebe, Red-necked Grebe, Pacific Loon, Common Loon, Bald Eagle, Red-tailed Hawk, Golden-crowned Kinglet, Chestnut-backed Chickadee, Killdeer, Mew Gull, Thayer’s gull, Glaucous-winged Gull, Belted Kingfisher, Northern Flicker, European Starling, Spotted Towhee, Lincoln’s Sparrow, Fox Sparrow, Song Sparrow, Red Crossbills, Golden-crowned Sparrow, Dark-eyed Junco, Purple Finch and Red-winged Blackbird. Two Townsend’s Warblers are visiting suet feeders in the Divers Lake area of Nanaimo. A pair of Evening Grosbeaks are visiting feeders in the 2100 block of Boxwood Road in Nanaimo. The Tuesday bird walk went to the Little Qualicum River Estuary in Qualicum Beach. The morning was clear and sunny with a strong wind off the Strait of Georgia. The surf was up and pounding into the shore. The highlights included seeing Black-bellied Plovers, Black Oystercatchers, Sanderling’s and a small flock of Dunlin near the shore at the viewing platform. Throughout the morning, further offshore, thousands of Common Murre were heading up the Strait. We counted one hundred and thirty Trumpeter Swans at the mouth of the Little Qualicum River. A large raft of Greater Scaup was not far from shore. Common Murre, Belted Kingfisher, Northwestern Crow, Common Raven, Chestnut-backed Chickadee, Spotted Towhee, Golden-crowned Sparrow, Dark-eyed Junco, Red-winged Blackbird and House Finch. A Summer Tanager is still being seen in the Columbia Beach area. A Common Redpoll was spotted in with a flock of Pine Siskins and an American Goldfinch by the Oak Trees on the Dyke at Buttertubs Marsh in Nanaimo. A Townsend’s Warbler is visiting feeders along Dawkins Lane in Nanaimo. A small flock of Ring-necked Ducks were seen on the marsh at the end of Harwood Road in Nanaimo. Monday, January 23, 2012 at,7:30 pm. Thursday, February, 09, 2012 at 7:00 pm. The Tuesday bird walk will be going to Deep Bay on January 17. We will meet at Parksville Community Park at the parking lot near the Lions Playground at 9:00 A.M. or the Marine Harbour at Deep Bay at about 9:35 A.M. The Sunday bird walk on January 22 walk will be going to the Plummer Road side of the Englishman River Estuary in Parksville. We will meet at the Birdstore at 9:00 A.M. or the corner of Plummer Road and Shorewood Drive at about 9:30 A.M.
As part of the VIU Science and Technology Spring Lecture Series, I have invited Derek Matthews of the Vancouver Avian Research Centre to present some of the interesting bird monitoring they’ve been conducting. The lecture will take place on Wednesday, February 1, 19:00. The details are available at the links below. These lectures are open to everyone. Brant, Black-bellied Plovers Black Turnstones and Dunlin: John Purves Photo. The Tuesday bird walk went to the Little Qualicum River Estuary in Qualicum Beach. The morning was clear and sunny with a strong wind off the Strait of Georgia. The surf was up and pounding into the shore. The highlights included seeing Black-bellied Plovers, Black Oystercatchers, Sanderlings and a small flock of Dunlin near the shore at the viewing platform. Throughout the morning, further offshore, thousands of Common Murre were heading up the Strait. We counted one hundred and thirty Trumpeter Swans at the mouth of the Little Qualicum River. A large raft of Greater Scaup were not far from shore. SUMMER TANAGER was reported up at Columbia Beach area on Monday & Tuesday. COMMON REDPOLL was seen in with PINE SISKINS and AMERICAN GOLDFINCH at Buttertubs Marsh by the oaks on the dyke. The Sunday bird walk went to the Nanaimo River Estuary in south Nanaimo. The morning was cloudy with a wind. The big highlight of the morning was the sighting of a dark phased Rough-legged Hawk. We watched the hawk for the most part of the morning as it perched and hunted in the estuary. We were able to compare the Rough-legged Hawk with a Northern Harrier as they both flew over the estuary. Canada Goose, Trumpeter Swan, Mallard, Northern Pintail, Green-winged Teal, Greater Scaup, Bufflehead, Barrow's Goldeneye, Common Goldeneye, Common Merganser, Bald Eagle, Northern Harrier, Rough-legged Hawk, Sharp-shinned Hawk, Northern Shrike, Glaucous-winged Gull, Mew Gull, Belted Kingfisher, Northern Flicker, Northwestern Crow, Common Raven, Chestnut-backed Chickadee, , American Robin, Spotted Towhee, Song Sparrow, Dark-eyed Junco, Fox Sparrow and Golden-crowned Sparrow. A juvenile Bald Eagle was spotted flying over Colliery Dam Park in Nanaimo. A Cooper’s Hawk, a Sharp-shinned Hawk, a Merlin and a Red-tailed Hawk were seen on the 100 block of Meridian Way in Parksville. A Tundra Swan and a Mute Swan were seen at Deep Bay. Two Northern Flickers, one Northern Shrike, Pine Siskins, House Finch, Purple Finch, Spotted Towhees, Dark-eyed Juncos, European Starlings and American Robins are visiting backyard feeders along Farquhar Street in Nanaimo. A Bald Eagle, a Red-tail Hawk and three Anna's Hummingbirds were seen at Colliery Dam Park in Nanaimo. The Tuesday bird walk went to Columbia Beach. It was a blustery morning with clouds, rain and a strong wind. The surf was rolling off the Strait of Georgia all morning. Our highlights included seeing two Long-tailed Ducks flying right at us and then disappearing in the waves not far from shore. Pacific Loons and Common Murre were spotted flying further offshore. We spotted several Black Oystercatchers, one Greater Yellowlegs, over twenty Black Turnstones, two Sanderling, Mew Gulls, one Herring Gull, Thayer's Gulls, Glaucous-winged Gulls and six Brant on the gravel bar at Pebble Beach. As we were returning to our cars, we watched as twelve White-crowned Sparrows and one House Finch bathed in a puddle of water on the side of the road. Bald Eagle, Black-bellied Plover, Black Oystercatcher, Greater Yellowlegs, Black Turnstone, Sanderling, Dunlin, Mew Gull, Herring Gull, Thayer's Gull, Glaucous-winged Gull, Common Murre, Rock Pigeon, Eurasian-collared Dove, Northwestern Crow, Common Raven, Chestnut-backed Chickadee, American Robin, Spotted Towhee, Song Sparrow, White-crowned Sparrow and House Finch. Eleven California Quail were seen on a front lawn feeding below the bird feeders in the 2300 block of Brackenwood Place in Nanaimo. A Townsend’s Warbler is visiting feeders along Lantzville Road in Lantzville. Ten Black Turnstones, two hundred Brant Geese and two Bald Eagles were seen at Rathtrevor Provincial Park in Parksville. A Herring Gull, A Long-tailed Duck, A Thayer’s Gull and a Rhinoceros Auklet were seen off Neck Point in Nanaimo. Thursday, January, 12, 2012 at 7:00 pm. The Tuesday bird walk will be going to The Little Qualicum River Estuary on January 10. We will meet at Parksville Community Park at the parking lot near the Lions Playground at 9:00 A.M. or at viewing platform near Highway 19a and Garrett Road at about 9:15 A.M. The Sunday bird walk on January 15 walk will be going to Nanoose Bay. We will meet at the Birdstore at 9:00 A.M. or near the beach behind the Church camp off Arlington Road and Highway 19 at about 9:20 A.M. The Tuesday bird walk went to Columbia Beach. It was a blustery morning with clouds, rain and a strong wind. The surf was rolling off the Strait of Georgia all morning. 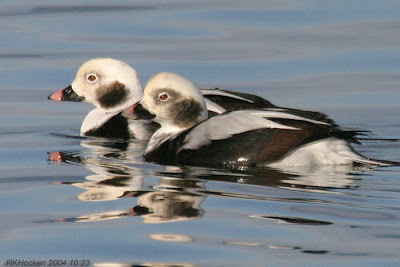 Our highlights included seeing two Long-tailed Ducks flying right at us and then disappearing in the waves not far from shore. 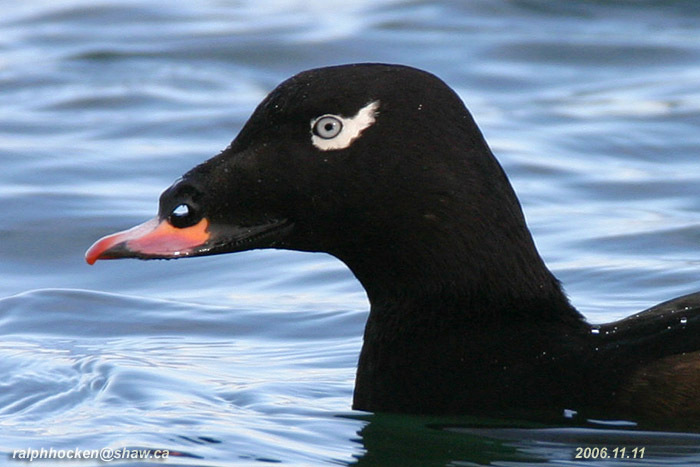 Pacific Loons and Common Murres were spotted flying further offshore. 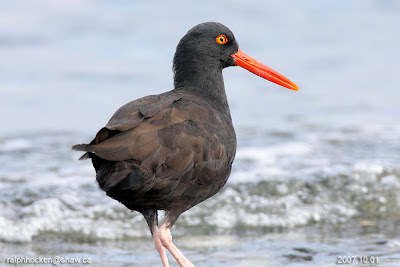 We spotted several Black Oystercatchers, one Greater Yellowlegs, over twenty Black Turnstones, two Sanderling, Mew Gulls, one Herring Gull, Thayer's Gulls, Glaucous-winged Gulls and six Brant on the gravel bar at Pebble Beach. As we were returning to our cars, we watched as twelve White-crowned Sparrows and one House Finch bathed in a puddle of water on the side of the road.